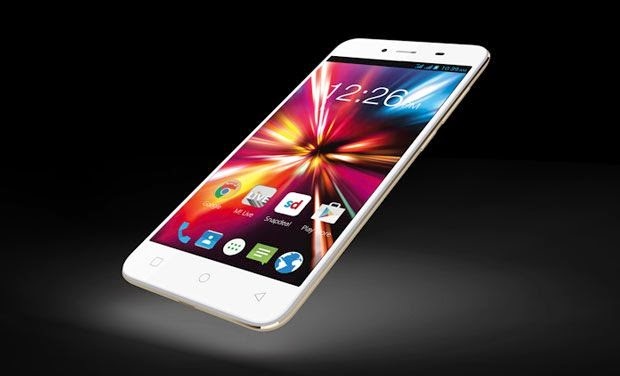 Micromax has recently launched the Canvas Spark Smartphone which has been priced affordably. The Micromax Canvas Spark is made available to the customers exclusively through the retail website, Snapdeal. The biggest USP of this mobile is its price and the aspect that it runs on the latest Android Lollipop 5.0 OS. Apart from Intex Aqua L and Moto E second generation, Canvas Spark is one of the latest budget smartphones that runs on the latest Android OS version. Micromax has put in lot of efforts to launch its latest budget device, the Canvas Spark that boasts of premium and elegant looks. This mobile device is available in white and black colours to choose from. The device has a gentle curved design with 8.5 mm thickness which making this phone nice to hold. This budget smartphone weighs just around 134gm for comfortable daily usage. The gold trim that runs along the edges is actually plastic with metallic coating and not real metal, but it add some class to the overall design. Micromax Canvas Spark boasts of a QHD screen of 4.7 inches that is compact enough to ensure ease of use. The screen size is big enough to read and view videos and pictures comfortably. Text on the screen is also easy to read and appears crispy. The device’s screen resolution is around 960×540 pixels, while also providing good viewing angles to help the users to get the most out of it. However, the screen’s brightness levels are not good enough to compensate the reflective nature of the display. Nevertheless, with capacitive touch screen and corning gorilla Glass 3, the Micromax Canvas is much better when compared to its competitors. Above the screen, you can find the front camera, light sensor and earpiece. The touch sensitive capacitive buttons ensure easy navigation but the buttons are backlit and are difficult to see. The screen is extremely prone to fingerprint smudges and has come with a screen guard which is really beneficial for those who are not so careful with their smart device. The most interesting features of Micromax Canvas Spark is Android L’ Floating as well as off screen notifications. It is also possible to swipe any of the notifications to the left in case you don’t want to look them at. Apart from this, you can also visit Notification setting and can block notifications from specific applications and select which ones should be shown in priority mode. While it is quite a daunting task to set off the notifications for every app, it is of great importance if you want your battery life to be saved. In addition, Micromax has also included a battery saver option in Canvas Spark which lets you restrict the background data use and apps such as email that rely on syncing, from opening if you have not opened them. One of the best features in the Micromax Canvas Spark is its camera. It includes both primary and secondary cameras. The primary rear camera is 8 MP which is not only a great option in budget range smartphones but also helps you to take high quality snaps easily. One can even expect to perform some great tricks in photography with this smart device. Of course, there is some noticeable lag in its camera features, especially when you switch modes but you can take sharp and clear pictures easily. When it comes to the front or secondary camera, it is just a 2 Mega pixel sensor. You can include filters and even click photos in the beauty mode. With the beauty mode canvas spark camera, you can easily take flawless pictures. When it comes to memory, the Micromax Canvas Spark has 8 GB of internal storage which is more than enough for an average user. However, those who are in need of more memory space then you can extend it with MicroSD up to 32 GB which can be used for all your extra apps and photos. Powered with Quad-core ARM Cortex A7 processor and MediaTek MT 6582M system chip, the Micromax Canvas Spark offers good performance when compared to the other budget smart phones available in the market. This device also includes Mali 400 graphics processor. However, the smartphone is not so responsive at certain times. In terms of benchmark, canvas spark has scored 19698 in AnTuTu and in quadrant, it has scored 5793. While this budget smart phone is aimed at the first time users, the user experience of canvas spark is above average. Micromax has enclosed the operating system in a minimal custom interface that is dependent on the material design interface of Android. Of course, there are certain changes made – the navigation keys are not integrated with the on screen interface. Rather, they are replaced with touch sensitive keys. As Canvas Spark runs on the latest android lollipop OS, it is considered to be the most affordable smartphone with the latest android platform providing great benefits such as improved application performance, rejuvenated notification system and optimized battery usage. In terms of connectivity, Micromax Canvas Spark supports various options including Bluetooth 4.0, Wi-Fi and USB 2.0. Other connectivity options include mass storage device, USB charging, micro USB, OTA Sync, computer sync, and Tethering. It is a GPRS and EDGE enabled handset and supports both 2G and 3G networks which means that the user can make video calls. Micromax Canvas Spark comes with 2000 mAh lithium ion battery. The user can enjoy talk time of up to 10 hours in 2G and 7 hours in 3G. The stand by time of the device is around 18 days in 2G and 14 days in 3G. Micromax has put in a lot of efforts to establish its presence in the smartphone industry with its Canvas Spark. With solid performance, elegant design and affordable price, Micromax has grabbed the attention of those who are longing to get a smartphone within their restricted budget. The author is an expert in mobile technology and loves to write about different handsets launched. He has listed the specifications Micromax Canvas Spark for the readers to make an informed buying decision.